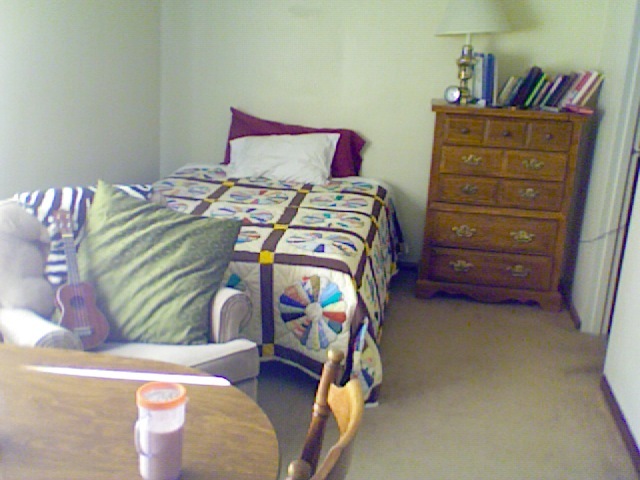 Welcome to the Upper Room , my cozy abode for the summer months. At the specific request of a friend I have posted some pictures of my dwelling. I don't know why I started calling it the upper room, except for the obvious fact that it is up 2 flights of stairs and therefore an "upper" room. Despite the short amount of time I am to reside here I went ahead and brought my own decor. 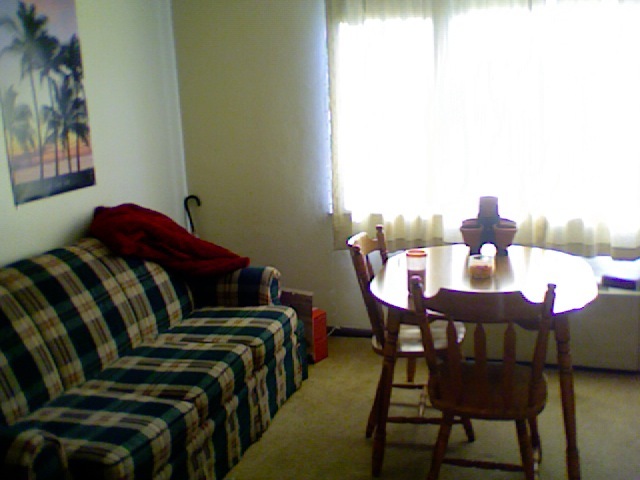 Its amazing what a little sprucing up can do for a somber apartment! At least it feels a little bit more like home. 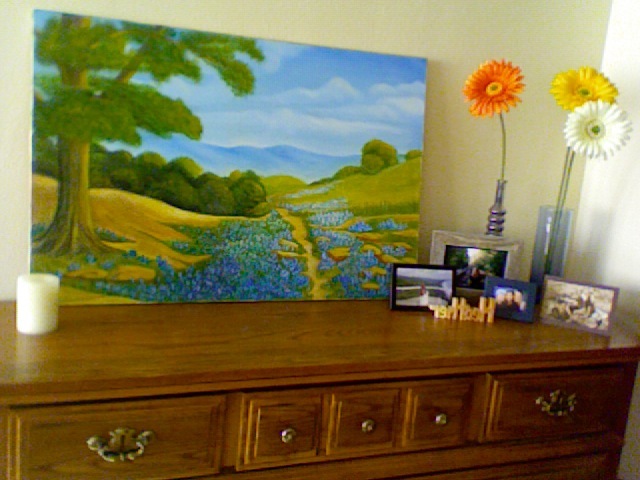 Wasn't my Grandma Haynes a great painter?! 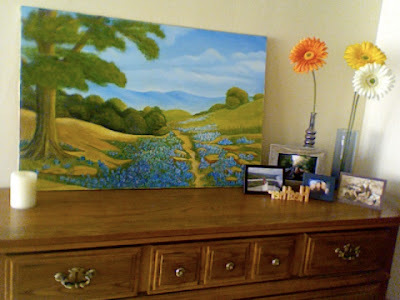 I love the bright colors and peaceful scene of blue flowers growing alongside the winding path. Here you see the dining room, living room, bedroom and library all in one! It's a very efficient living space. I promise you, its bigger than it looks. Between the family quilt, leaning books, zebra sheep skin and smoothie seen on the table it looks quite cozy and eclectic if I do say so myself! Oh man, now I've got to fill this space somehow because of the way I did the pictures...the key is adding lots of spaces. Oh! notice the ukelele sitting casually on the living room chair. We've been getting acquainted. Hopefully I will upload proof of our growing relationship on here soon. A view that better portrays the spacious quality. Behold the garden! New!-as of today! When you live in an upper room the garden has to be downsized considerably. 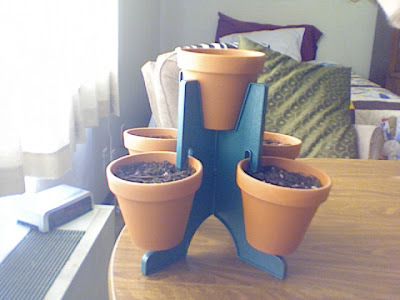 This indoor herbal garden from Grandma Cloey is just the ticket! It was technically a Christmas present. Hopefully those little seeds will still wake up and come alive even after being terribly neglected for half a year!